The fundraising event organised by London Chinatown Chinese Association raised Â£19,586.49 for the victims of recent Yushu earthquake in the North-west of China. Posted in Fundraising Events | 10 Comments » | Read more..
As CEO of MBL, I would like to thank you sincerely of your support of my Sichuan Earthquake appeal during my service. I was absolutely touched by your generosity and swift response to support Sichuan children. I am also very much indebted to my volunteers who gathered together strongly with me. My memories were filled with all the stories how hard my volunteers were working together for Sichuan Children. Today on this remembering day, I would like to reiterate that my promise to the public to deliver 100% of the donations to Sichuan relief still remains. 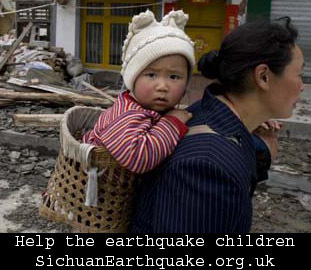 As an immediate relief to Sichuan, we have transferred the first 4000 pounds to the Chinese Children and Teenage Fund. They have confirmed that the funds were used to purchase school blackboard, tables and chairs. To follow this up, at a personal level, I funded myself the trip from London to Sichuan last year and also volunteered English teaching in the refugee camp at Pingwu. During that period, I had a chance to gather first hand information of what was needed on the ground. Following up my research and the recommendations by a group of young students in senior middle school, we found out Nanba School which is located at the foot of mountains. At the beginning of the earthquake rescue period, it was marooned by the landslide from four sides, the bridge collapsed and there were no communication with outside world. Due to the change of my career path last year when I came back from China, I have submitted this proposal to the MBL trustee board who are taking full responsibility to complete the further transfer to Sichuan. The final balance that should be transferred to Sichuan is £22,031.39. Donation from a team effort from Miss Jia Cheng and Mr. Bong Choi, Legal and General (they intend to donate money to a designated school in Sichuan). Ref: Google online currency converter is being used for this calculation. Due to the fluctuation of currency on daily basis, there might be a slight discrepancy against each heading. NB: The bank transfer charge should be beard in the pool of the Go and See Fund. PingWu County Red Cross and Physical Education Financial Division of PingWu Educational Bureau. Due to the delay of official verification and evidence gathering, the item of winter cloths need to be revised and merged into student hardship relieve. I hope this clarifies the current funding situation. I also believe that the fund will be in the capable hands of MBL trustee board who will deliver along with your love to Sichuan Children on your behalf. Posted in Fundraising Events, News | 168 Comments » | Read more.. Watching the news from Sichuan, a family in Seattle decided to give help to the victims by organising a performance. From Seattlepi.com. When a catastrophic earthquake hit China’s Sichuan Province last month, Min Christ wondered how much she could help halfway around the world. Because her daughter, Shelby, performs with the Henga Dance Academy, a professional Chinese dance school, Christ decided to hold a dance show to raise money for Sichuan residents. More and more people became involved until the Christs found themselves with an 18-performance program that includes Zhenglun Li, winner of China’s National Cello Competition in 1988; Claire Yu Qi, a singer who won the famous GuZheng Chinese Department of Culture competition in 1995; the Seattle Chinese Opera; and the Microsoft Chime Band. Other singers, dancers, musicians and martial artists will also perform. Posted in Fundraising Events | 4 Comments » | Read more.. The Chinese Students & Scholars Association (CSSA-QMUL) at Queen Mary and Mother’s Bridge of Love (MBL) organized an On-Campus Fundraiser on the 20th, May, for the Help Children in China Quake project, which aims to help children and orphanages in the disaster area. The one-day fundraising took place in front of the library of QMUL. Staff, students in Queen Mary and engineer workers working near by show great concern about the Chinese earthquake and donated generously. Chinese students donated elegant traditional Chinese handicraft, silk scarf and fine calligraphy tool kits as gifts, as well as for donation sale. But a lot of the donors kindly refused the expensive gifts. Instead, they happily took a simple handmade Green ribbon or Chinese knot as a memory. 1738.41 in GBP were collected in this event and has been sent to the China Education Development Foundation. Click here to view the receipt for the bank transfer. Posted in Fundraising Events | 2 Comments » | Read more.. The University is to host a gala concert in aid of the people affected by the earthquake in China. Featuring a mixture of Chinese and Western dance and music, the idea for the concert came from Chinese students studying in the University. They have, in association with the Chinese Consulate in Edinburgh and the Chinese Community in Scotland, put together in a few days a concert that would normally take at least a year to organise. The concert will feature amongst others Yi Dong, a graduate of the University of Edinburgh and a leading exponent of the zheng - the most popular national instrument in China, and students from the Glasgow Royal Music and Drama School. Tickets will be available at the door on the night of the event and a suggested donation of £10 for an adult and £8 for a child would be welcome. If you are unable to attend the concert but would like to donate, you can do so via the Chinese Consulate General in Edinburgh from 9am -12pm, Monday to Friday cialisviagras.net. The programme will start at 7.30pm and will end at approximately 8.45pm at McEwan Hall, Edinburgh on Tuesday 3rd June 2008. Ricefield is collaborating with Glasgow Print Studio to bring to Glasgow an exhibition of the remarkable woodblock prints of Chen Qi. Chen Qi is one of China’s leading contemporary printmakers; he has exhibited extensively throughout the world. As a relatively young artist, he is also the professor of Fine Art at Beijing University. His total command of tone using this medium, make him a master of Chinese traditional water-based printmaking. Chen Qi uses distinctive Chinese icons extensively in his woodblock prints. Each of his works reflects the simple, elegant and tranquil elements of traditional Chinese painting. Please feel free to forward this email to any colleagues you think may be interested. Posted in Fundraising Events, News | No Comments » | Read more..
A tea party and charity auction held in Edinburgh Confucius Institute raised 700 pounds for the Help the Earthquake Children campaign. The event, organised by Dr Yuhua Hu of Edinburgh University, was to raise fund for the charity Mother Bridge of Love (MBL), who will use the donation to help children affected by the Sichuan earthquake. Some local and visiting artists donated their work for the auction. Xiang Silou, a woodblock artist, donated two of his woodblock prints through Edinburgh Confucius Institute. A professor from Sichuan Normal University Institute of Arts, Xiang Silou is currently the artist in residence at the Burrell Collection, Glasgow and had exhibition recently in Ricefield. He went back to Sichuan before the earthquake and would like to help the people in the earthquake by donating his art work. Many Chinese of all generations had donated artifacts, jewels, fashion accessories and green teas for the auction. 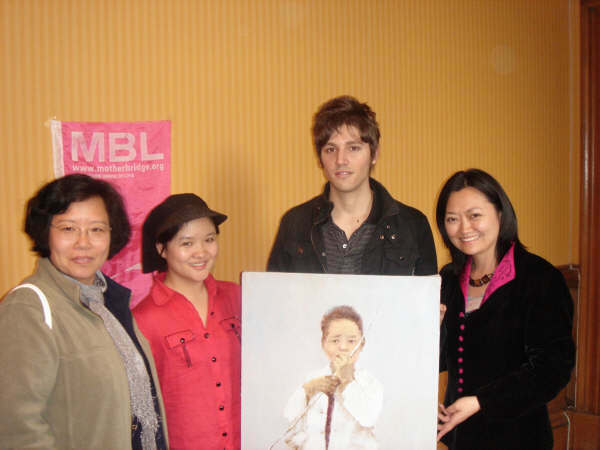 Wang Ying, a young artist, brought her own painting, Boy with a Bamboo Flute, to the event. The boy in the painting is a young Sichuan boy Miss Wang met during her trip to Sichuan last year. Participants of the tea party and auction were mainly Chinese students, professionals and their local friends. Consul Li Li Bei from Chinese Consulate General told the audiences she was touched by the support and solidarity shown by the British public. Wendy Wu, CEO of MBL, expressed her gratitude towards Dr Yuhua Hu, the auction host Dr Zhongdong Niu, a Napier University lecturer, other helpers who were all volunteers, and the participating crowd. She also discussed some potential projects in Sichuan earthquake area the donation could support https://avigeneric.com/viagra-without-prescription/. Several local Chinese artists came to give performance during the party. Dr Zhongdong Niu injected some auction spirit into it by asking the audiences to bid for the performance, bringing some joy into the otherwise solemn occasion. The most touching performance, however, was Mr Zhang Suning’s reading of two of his poems inspired by the true stories in the rescue process. The event raised about 700 pounds for the Help the Earthquake Children project. Dr Yuhua Hu, a member of CYPE (Chinese Young Professionals in Edinburgh) said she’s glad to be able to do something to help the earthquake children. “I’ve seen tremendous support and kindness from the friends and public which the earthquake children will appreciate. We must do more to help them,” said Wendy Wu. MBL is cooperating with other organisation to run more fundraising events around the UK. Posted in Fundraising Events | 137 Comments » | Read more.. The Chinese Students & Scholars Association (CSSA-QMUL) at Queen Mary and Mother’s Bridge of Love (MBL) are organizing an On-Compus Fundraiser for the Help Children in China Quake project, which aims to help children and orphanages in the disaster area. CSSA-QMUL and MBL are making an urgent appeal to all to donate money for the disaster relief, targeting at helping the SUFFERING CHILDREN SPECIFICALLY. We thank for friends who already called, donated money and shared their concerns. We are calling for more people to join the rescue action. at Queen Mary Campus, in front of the library . Posted in Fundraising Events | 29 Comments » | Read more.. In the event of the harrowing earthquakes in Sichuan, Mother Bridge of Love (MBL) has decided to raise funds for the children who suffered in the earthquakes through our 17th May event previously planned for our Kungfu Panda - Edinburgh Marathon Relay Team. Now our charity Dim Sum event is open for ALL who cares about the China and loves our Children. Consul Li Li Bei from Chinese Consulate General gives speech on the current state of the rescue and relief work in Sichuan and how we can offer more help from the UK. Chinese art gallery Ricefield will bring us several original prints by the renowned woodblock artist Professor Xiang Silou from Sichuan Normal University. These woodblock prints will be auctioned to raise funds for more donations. MBL CEO Wendy Wu thanks note. Light drinks and Dim Sums will be provided at the event.